Whether you're in the car heading over the river and through the woods to Grandmother's house, or just looking to have some fun sitting by the fireplace, this holiday season we have some great Christmas apps for you to check out. 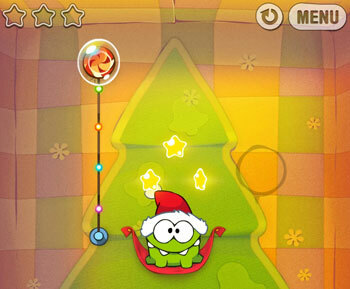 This highly addictive kid-friendly game has a Christmas counterpart. Version 2.0, which just released on December 17th, now includes Christmas gifts that you can collect as you jump your way up. Each gift contains coins inside that can be redeemed for new outfits with their own special abilities. A personal favorite, this app, while a little off, is hilariously funny and a lot of fun for kids to play with. 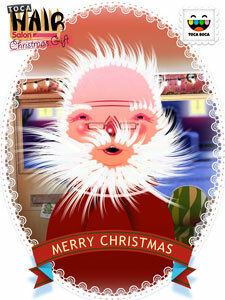 You can cut or trim Santa’s hair, grow it back, change the color and blow dry it with a hairdryer. 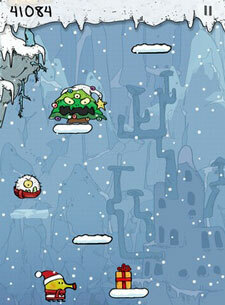 Sound effects accompany all of the actions within the app, adding to the fun. There are two characters to choose from and once you’re done, you can take a picture of your work and share it with friends. A truly quintessential Christmas app, this story has the original animation from the show, including dialogue and music. 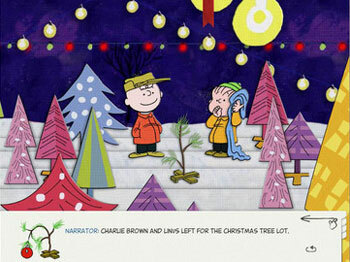 Tapping certain areas of the screen within each page delivers great character interactivity, bringing Charlie Brown and the gang to life. You can also decorate your own Christmas tree. You can purchase in-app packs that add games, content, tree toppers and ornaments. 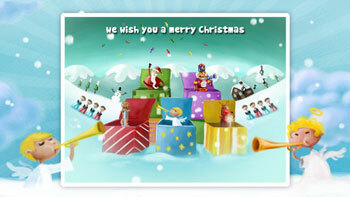 Created to teach kids Christmas songs, this app is beautifully designed with bright colors. Jolly Jingle has five songs within the free version, including Jingle Bells, Rudolph the Red-Nosed Reindeer, Frosty the Snowman, Up on the Housetop, and We Wish You a Merry Christmas. Lyrics appear at the top of the page so children can follow along, and the songs themselves are sung by kids making this app very kid friendly. 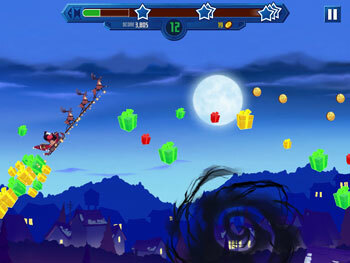 If you thought Cut the Rope was addictive, the you'll love the holiday version of this popular game. The objective is simple: feed Om Nom by cutting the appropriate sequence of ropes to feed him peppermint candy. The app has cute hidden extras, like shaking your iPhone or iPad causes Om Nom to put on a pair of antlers.You also can create your own sharable Om Nom greeting card. Based off the new animated movie Rise of the Guardians, this is a fun and entertaining holiday app has you taking to the skies in the Guardians’ sleigh to collect presents to deliver around the world. Based on how well you do, the presents and coins advance you in the game and you’ll get additional powers. Given that this app is paid and not free, we were a little surprised that it required in app purchases to buy additional coins. We advise this game for slightly older kids, as part of the game requires you to avoid Nightmare creatures, which could be scary to some children.